Kazuo Hosomichi (GCOE Program-Specific Associate Prof.) was selected to receive the 6th Yukawa-Kimura Prize. There was the award-giving ceremony on January 23 at Panasonic Auditorium in the Yukawa Memorial Hall, followed by the commemorative lecture titled "The Mystery of M-theory and Branes". Yukawa-Kimura Prize was established in 2007 based on part of the heritage of the late Prof. Toshiei Kimura donated to the Yukawa Memorial Foundation. The prize is given annually to a scientist who has made significant contribution to fundamental, theoretical fields of gravity and spacetime theories or field theory, to which Prof. Kimura made many pioneering contributions. According to the comment by the selection committee, Prof. Hosomichi has made significant achievements in constructing exact solutions of 3-dimensional supersymmetric gauge theories using the localization principle, and gave important contributions to the study of dynamics of the 11-dimensional ultimate theory called "M-theory". Superstring theory is a theory of very tiny strings moving in 10 dimensional spacetime. M-theory is yet another quantum theory of gravity which was discovered from studies of strongly intereacting strings. 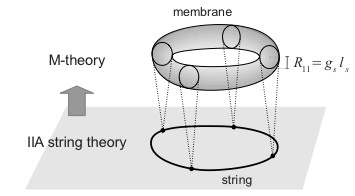 In M-theory, the fundamental element is membrane, instead of string, moving in 11 dimensional spacetime. These theories are regarded as the most promising candidate for the ultimate theory which unifies the quantum mechanics of particles with Einstein's theory of gravity. Recent studies have given rise to many interesting ideas for the unresolved problems in our current standard models of particles and cosmology. An important achievement of Prof. Hosomichi is the systematic construction of 3-dimensional gauge theories with high supersymmetry. Some of those theories were later applied to the models of collective motion of membranes, and led to a big breakthrough in the understanding of M-theory. Prof. Hosomichi also studied general supersymmetric theories on curved spaces, and developed the techniques to evaluate physical quantities exactly. For more details of the Yukawa-Kimura Prize, please see this page. GOE International Exchange Program (2011)�@is now UP!.